During the last several decades the fund of ancient Turk runic inscriptions from the Talass province of Kirgizstan has been considerably expanded due to new finds. Along with the already known texts on separate rocks 1, several short graffiti were found, significant both from the point of view of cultural history (because inscriptions of this kind testify to the relatively widespread use of this kind of runic script among the Turkish-speaking inhabitants of Tien Shan in the early medieval period) as well as from the historical-linguistic perspective (for these incriptions contain lexemes, the semantic range of which is not always quite clear). Until recent only four Turk runic inscriptions from the Tereksaj ravine were known2. Several Sogdian inscriptions were found nearby. In the autumn of 1981 three more rock inscriptions were found by the expedition of the Institute of History and the Institute of Language and Literature of the Kyrgiz Academy of sciences (directed by I. Kozhomberdiev and Ch. Dzhumagulov) in the ravine of Kuru-Bakajyr (the Talass Ala-Too), 2500 mts. above the sea level. One inscription was in Sogdian (studied by V.A. 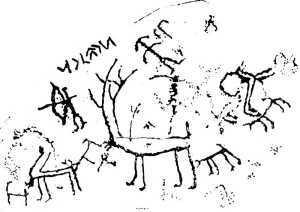 Livshits), two other inscriptions were written in runic script (submitted to the author of the present article for investigation). Both inscriptions were carved on a low rock, on its south-east side facing the Kuru-Bakajyr river (the Suuluu-Bakajyr basin) appoximately 2,5 km above its mouth. Among the numerous petroglyphs covering the surface of the rock there are images of humans in mushroom-shaped hats, of archers, ibexes, stags, wolves and ulars. The first inscription is written in one line, 14 cm long, in the upper corner of the south-east side of the rock. It contains six characters about 3 cm high (fig. 1). It is quite well preserved, so the letters can be easily distinguished. Its palaeography is the same as of other Talass runic inscriptions; the initial q in the word qut is reversed, which is a common feature in the Enisej and Talass runic epigraphy. The reading: qutčor. The name-title qutčor consists of two components, each of them often found in Old Turk onomastics and titulature. The word qut in runic texts probably had a more limited semantic range than in the Ancient Uighur literature. Its lexical meaning was probably confined to such notions as "princely charisma", "grace of heaven", "blessing"3. In Old Turk titulature the derivative form qutluγ was commonly used along with other titles combined with qut: ïduq qut (the title of the chief of the Basmyl tribe, later of the Uighur princes of Turfan), qut tengri xatunï (proper name)4, bilge qutï (the title of Uighur nobles according to Juwaini)5. The title čor, apparently of Iranian origin6, was widespread among the highest nobility of the Western Turkish Qaganate. In the 7th century it was the traditional title of the ruling dynasty of the Talass valley (qara čor, qumar čor)7. The second runic inscription (fig. 2) was carved in the lower part of the same rock. It is one line of five characters 11 cm long, the height of the letters is about 6 cm. It is drawn in rather shallow strokes upon the uneven eroded surface of the stone. Its palaeography makes us date it to a later period than the first inscription. The reading: šarγa. It is one of the rare cases when a Sogdian word is written in Turkish runic script: runic šarγa < Sogdian šaγw, šrwγ (šarγaw, šaraγ) "lion", with an appropriate loss when adopted into Turkish of the final billabial w.
Here the word was obviously written as a name or a part of a name, being a calque (loan-translation) of the name-title arslan so widespread in the Karluq-Qarahanid environment. Not only the choice of the alphabet but also the form of linguistic adaptation shows that the author of the graffiti was a Turk, and that the inscription can not be dated earlier than the late 9th or 10th century. Sogdian šrγn was in use up to the beginning of the 11th century. Cf. 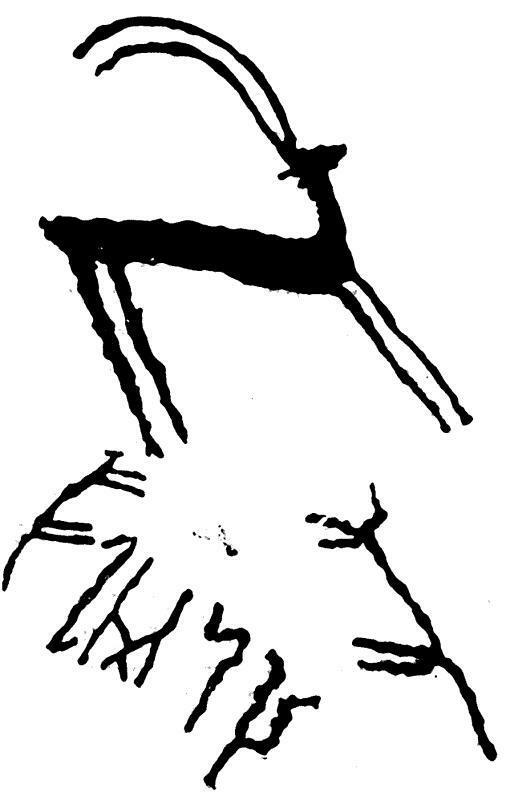 also Khotano-Saka śśargä (up to the 10th century). Classical Persian šēr appeared in Dari not earlier than the late 8th or 9th century8. 1 V.A. Kallaur. Novye arheologicheskie nahodki v Auleatinskom uezde. Protokoly i soobstcheniya Turkestanskogo kruzhka lyubitelej arheologii. Year 3. Tashkent, 1897-1898; M.E. Masson. K istorii otkrytiya drevneturetskih nadpisej v Srednej Azii. Materialy Uzkomstarisa, fasc. 6-7, Moscow-Leningrad, 1936, p. 10-11; Ch. Dzhumagulov. Epigrafika Kirgizii. Frunze, fasc. 1, 1963, p. 15-34, fasc. 2, 1982, p. 11-21; I.A. Batmanov. Talasskie pamyatniki drevnetyurkskoj pis'mennosti. Frunze, 1971, p. 4-26. 2 S. Sadykov. Drevnie nadpisi v ustchelyah Kulan-saj i Terek-saj. Materialy po obstchej tyurkologii i dunganovedeniyu. Frunze, 1964, p. 103, 106; Ch. Dzumagulov. 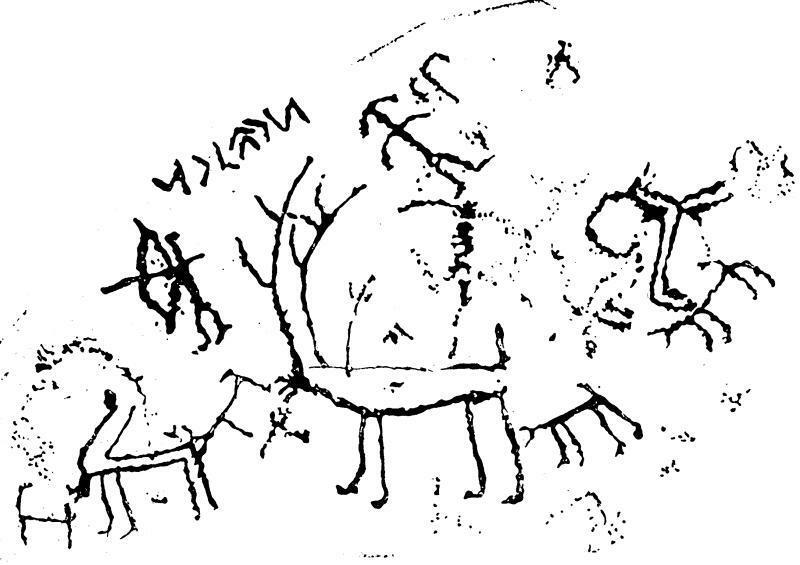 Epigrafika Kirgizii, fasc. 2, p. 17-19. Pl. IV, 1, 2. 3 A. Bombači. Qutluγ bolsun! A contribution to the history of the concept of "fortune" among the Turks. – UAJ, Bd. 36, 1965, fasc. 3-4, p. 289-290; M. Mori. The T'u-chüeh concept of Sovereign. – Acta Asiatica, Tokyo, 1981, no. 41, p. 58-74. 4 "Drevnetyurkskij Slovar" (Old Turk Dictionary), Leningrad, 1969, p. 110. 5 G. Doerfer. Türkische und Mongolische Elemente in Neupersischen. III. Wiesbaden, 1963-1975, S. 553. 6 P. Aalto. Iranian contacts of the Turks in pre-Islamic times. "Studia Turcica", Budapest, 1971, p. 35. 7 S.G. Klyashtorny. The Date of the ancient inscriptions of Semirechie – "Altaica Osloensia". Proceedings from the 32nd Meeting of the PIAC. Ed. by B. Brendemoen. Oslo, 1990, p. 219-221. 8 I would like to thank V.A. Livshits and P.B. Lurie for consultation.